Washington State may well remember 2017 for the abundance of its sweet cherries from the Yakima Valley. The record crop came in late but the fruit has continued for nearly two months, with unusually low prices and delicious, plump fruit. For those of us who nearly turn into myna birds during cherry season, it has been cause for celebration. As I’m not only a cherry fanatic, but also all but live on salads throughout the summer, I was inspired to create my own take on a recipe from Everyday Vegetarian. 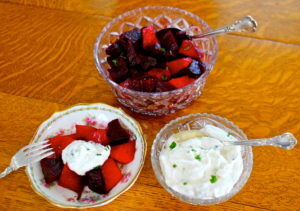 It’s perfect for picnics, a side dish for a potluck, or a light supper with grilled fish or chicken. 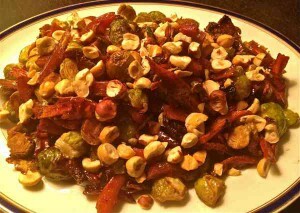 Nothing wilts in this salad and you can double it easily and make it ahead of time. The recipe calls for goat cheese. If you are not a fan of goat cheese, there are soft cow’s milk cheeses you could substitute or you could be bold and use blue cheese or gorgonzola. I used one of my special favorites, Bucheron, made from goat’s milk, which is also made from cow’s milk. There are also some excellent vegan soft cheeses; one of my favorite vegan cheese makers is Kite Hill. 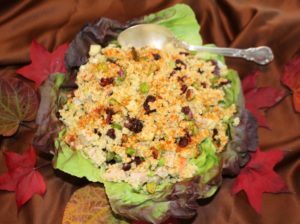 I hope you’ll enjoy the many textures and flavors in this salad. 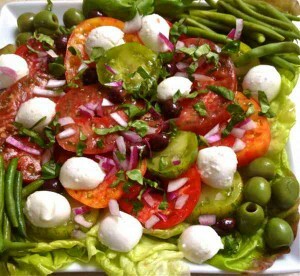 If you want, lay a bed of greens down then place the finished salad on top. 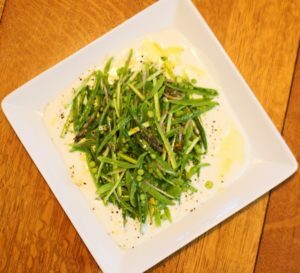 You will want to double the dressing if you do this. 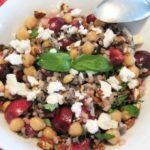 Place warm wild rice, onions, basil strips (or chopped parsley), chickpeas or cannellini beans, and cherries in a medium bowl. Mix salad dressing ingredients and blend it into the salad. Season with salt and freshly ground pepper. 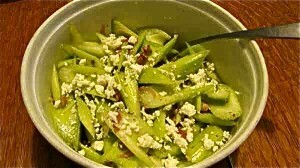 Top with goat or cow’s cheese and pecans.